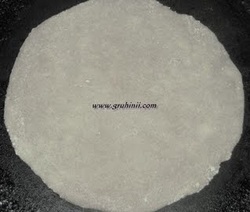 Make dough from maida and wheat flour and keep it aside. Onions, coriander leaves and salt. Heat a frying pan. 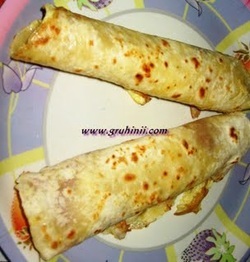 Roll the chapatti, and place it on the pan. 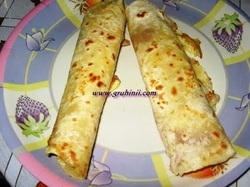 Fry one side of it and then turn the chapatti. 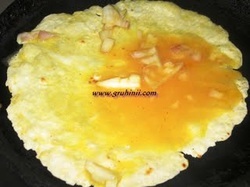 Now carefully spread about 2 table spoons of beaten egg mixture over the chapatti. Smear some oil and fry in a medium flame till it is done. 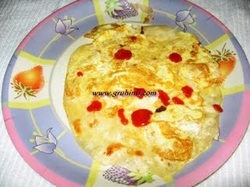 After done take it into a serving plate spread some tomato ketchup and roll it serve hot.